This challenge was to exclusively use Cricut Craft Room (CCR) digital cartridges (with at least 3 image cuts). 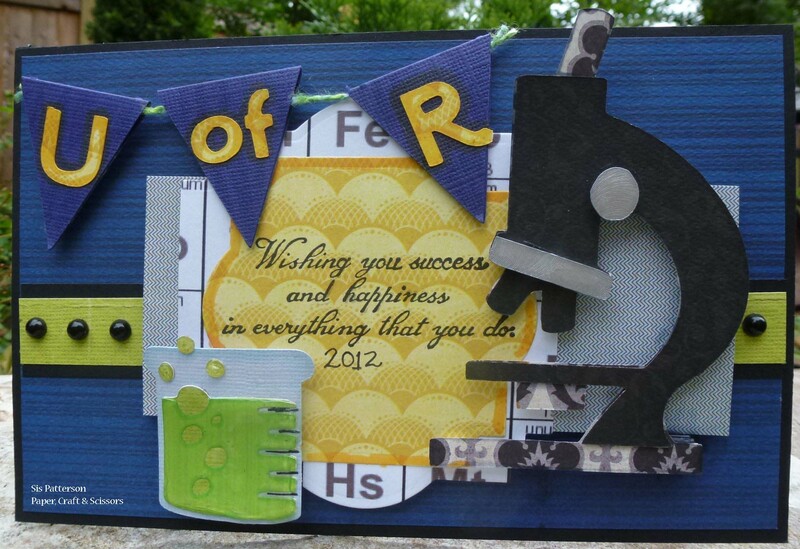 I used the Cricut Craft Room Basics (included with the free CCR program), Chemistry Icons, and Party Picks and Pennants digital cartridges. If you haven’t tried CCR yet, you should! The pennants (flag7_s) were cut at 3.6 inches in height. The 0.8 inch “U” and “R”, the 0.5″ inch “o”, and 0.7 inch “f” are from Cricut Craft Room Basics. The microscope was cut at 4.5 inches and the beaker at 2 inches. The beaker has the requisite dose of Diamond Glaze and of course, there is a good amount of Copic coloring on many of the elements. I used my Spellbinders Label 22 for the sentiment labels. In keeping the scientific theme, I printed the periodic table on a piece of white cardstock before cutting the background label. Overall, the card measures 5.25 x 8.25 inches. And for those of you who may still be on the fence regarding Papertrey Ink, I can’t recommend their cardstock strongly enough (it’s the black frame on this card) as it offers great stability. This card will need to be mailed – but I am confident it will arrive in good condition if I use a Priority Mail envelope (after I wrap in it plastic to ensure any rain does not adversely affect it). Very cool card! Good luck in the challenge! Wow!!! I love the images on your card! Cool beaker of green bubbling stuff!! Great masculine card and youthful too — very hard to do I think! Well you have sold me on Papertrey Ink card stock! And you are really cranking out these challenges! Kudos to you for keeping on your crafting schedule! I got a bit derailed this evening but I keep hoping I will get another one done! I love that you used the periodic table! Fantastic job! What a great card!! Love that microscope :D. It’s going to be a favorite!!! Long time no see. 🙂 I hope when I acclimate to this night shift thing, I will have time to play with my paper. Off this weekend. Busy all day Saturday with the kids, but I am going to finish cutting Mr. Pulled Chicken pieces. This card is fabulous! I love the tie in to the degree. What a fabulous idea. That beaker is so cool…with it’s mad science self. And the microscope is such a perfect cut for the cell lover in all of us. Really fun card. You did an awesome job on this – and all of your – challenges. Enjoy the rest of your week!